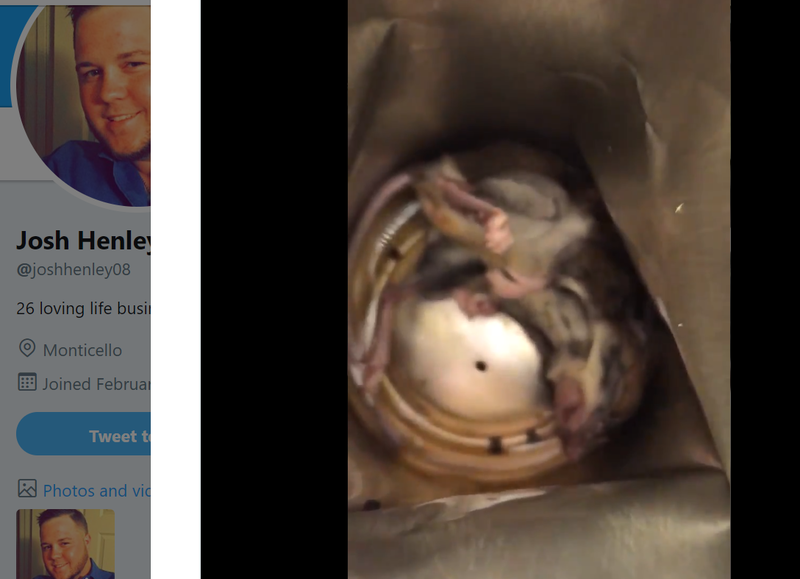 Did an Arkansas man find a dead mouse at the bottom of his Red Bull can? Yes, but it most likely crawled into the open can when the man left it in his truck overnight. The mouse is small enough to sneak through the opening, but appears too freshly dead to have been in the beverage can since the day the drink was manufactured in Austria or Switzerland. Well guys I think Red Bull just lost my business !!!!! Bought a Red Bull last night and well I happen to look in it was bout to spit sunflower seeds and I see a damn mouse people check your stuff !!! I never finished the drink i only drank half of the Red Bull!! 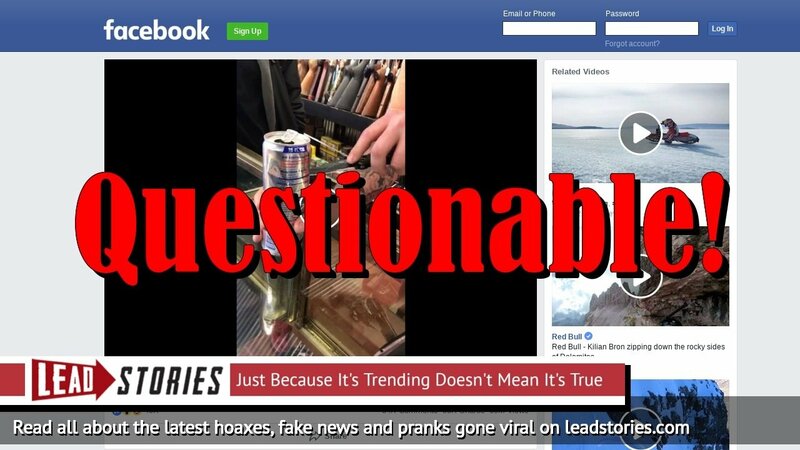 The video was also posted on the Arkansas man's Twitter feed, three days after he posted in Facebook, along with the message "This is the real deal I have no need to post fake news feel free to ask me anything thanks !!!" "I drank a Red Bull last night, and you can't see it, but apparently I shouldn't have got Red Bull 'cuz there's mouse in there," Henley said as he began his video. "I don't know if it's factory or what." Henly then gets a knife to cut the can in half. "This is crazy, because I drink Red Bull all the time and I think I'm just going to quit," he said as the cutting was completed. "There's a dead rat in my dang Red Bull. So, check your Red Bull before you drink them. Apparently, they might have rats in them." It is true. There was a dead mouse at the bottom of the freshly-cut Red Bull can. Why did we conclude that is unlikely this little creature was in the Red Bull can before Henley opened it and drank half of the contents? The best clue is from KARK TV news story published within 24 hours of the discovery. Henley acknowledges that the opened, half-empty can was left overnight in his truck. He only realized there was a mouse inside the next day when he decided to drink the remaining contents. Josh Henley, better known to his friends as Butterbean, says he bought a can of Red Bull at a gas station in Hamburg Sunday night. He says he didn't drink all of it, and left the can in his car overnight. When he poured out the remainder this morning, he discovered a dead mouse inside the can. "When I emptied it out, I heard that thud, I was like 'what is that?! ', and I said 'oh my God' so I said 'I gotta film it 'cuz nobody's gonna believe it', so, I cut it open and my God, it's a big ol' mouse in there," says Josh Henley. 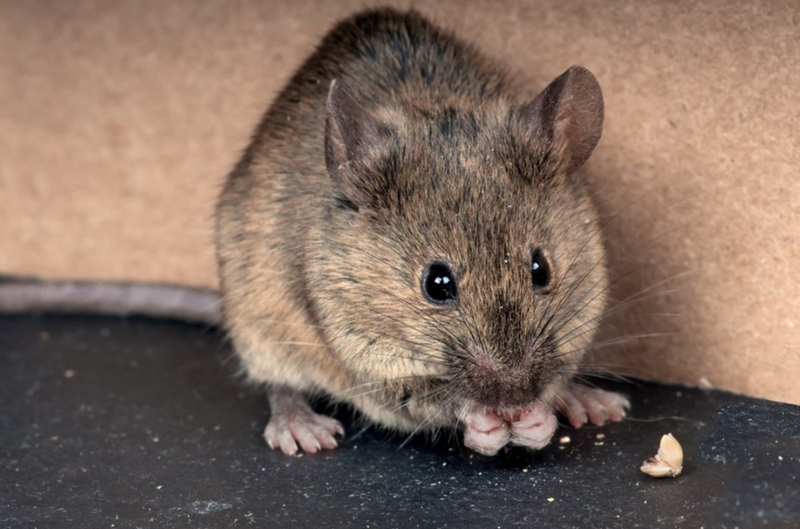 Jimbo Carter, the owner-operator of Dee's Pest Control (which serves Henley's town of Monticello, Arkansas) told Lead Stories that crawling in an open beverage can left in a truck overnight is normal behavior for a house mouse. These mice seek food sources in the nocturnal hours. He doubted a mouse would have managed to enter a can at the Austrian or Swiss factory. The can would have been empty before sealing during production, giving a living mouse no incentive to enter. Another clue: The mouse appears freshly deceased and shows no deterioration from weeks of sloshing around inside a traveling Red Bull can. All Red Bull is produced and packaged at factories in Austria and Switzerland before being shipped to 171 countries around the world, according to the beverage maker. "This is fresh dead," said death investigator Joseph Scott Morgan. Lead Stories consulted death investigator Joseph Scott Morgan, who teaches applied forensics at Jacksonville State University in Alabama. Morgan, who has familiar roots in Monticello, Arkansas, examined images of the mouse at the bottom of the can. "This is fresh dead," he said. Morgan noted that it's nose and feet were still pinkish and the opened eye was glistened. This indicated the mouse had only recently died as the nose and feet would have darkened and the eyes would be clouded if the animal had died earlier, Morgan said. Morgan also saw no signs of expected decomposition, such as sloughed hair. "It would come off in patches" if weeks had passed, he said. The fur's color also appeared normal, unlike what he would expect from a mouse that died weeks earlier. Finally, Morgan noted that Red Bull ingredients are corrosive, resulting in "free-floating hair and tissue would be loose." Unfortunately, we could find no record of a necropsy being performed on the mouse, which might have definitively answered the question: Did this mouse drown in the can or was it killed outside the can and then placed inside? A study of the lungs could have shown if the mouse breathed in liquid Red Bull after voluntarily crawling inside in the search for food. No liquid in the lungs would have suggested otherwise. A Red Bull spokesman denied it is possible for the mouse to have been added to the can at the factory" "It is inconceivable that a particle - let alone anything like this - could pass through the processes of world-class, modern beverage manufacture." A typical house mouse in happier times.